Nobody appreciates the voice that tells you “your business is important to us, please hold the line” when you call your electricity company. Badly scripted auto responses can easily have the same impact if they are mishandled. But well thought out auto-responses improve customer service by keeping customers informed of what is happening and helping agents be more productive. And unless you’ve been hiding under a rock these past twelve months you will have been exposed to the hype around the use of bots in customer service. Auto-responses are the most basic version of a bot, so using them is an easy first step to take down the promising, but as yet unchartered path that is A.I. If you have found yourself wondering what the best way to use first responses is or what the most appropriate busy message wording might be, the following ideas may be of interest. Say your business is a transportation company or you run a popular mobile app and a sudden event has temporarily disrupted your entire service. What normally happens then is your customer service team get swamped with the same call or message a thousand times over. 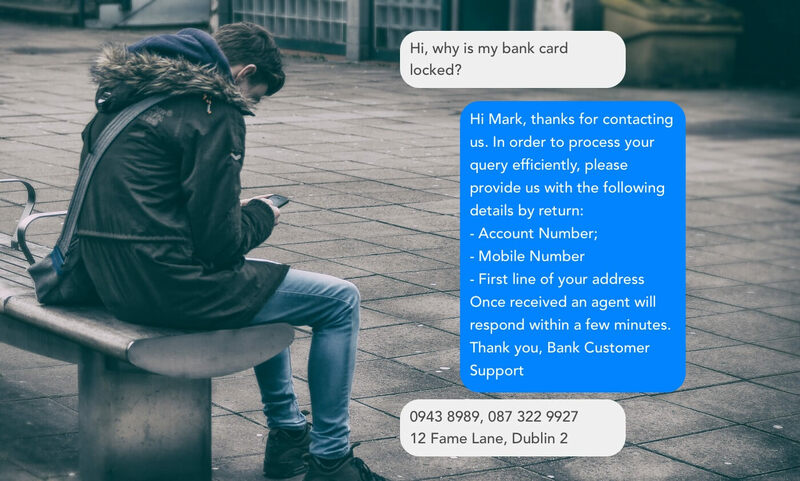 But if your customers were contacting you via a messaging app you could simply change your first response to notify customers that you’re aware of the issue and are dealing with it. Very efficient for both customers and agents alike. In an ideal world, you might actually be able to forewarn customers of the issue via a Messenger or WhatsApp notification. Another excellent use case applies to businesses that might need to do DPA (Data Protection Act) Checks/user identity checks. DPA checks can take up so much of an agent’s time, but what if the first response message asked the customer to provide the necessary information so it was immediately available to the agent when the customer/agent chat actually starts? Another option might be to use it to gather critical information to help your agents answer the question quickly. For example, if the user is coming from an app, what type of phone they have or what OS version they’re running. Simple questions that speed up the customer service experience to the benefit of all. The busy message is probably a bit more straightforward, but there are good and bad ways to tell your customers that you’re too busy to deal with them immediately. The nice thing about messaging is that you can follow up with the customer on the same channel and they will get notified when you do (not possible on web chat and potentially very inconvenient on the phone), so take advantage of that. It might be worth reminding people in the busy message to check that notifications are turned on for whichever app they’re using. If you respond quickly and they don’t realise it until 24 hours later, it takes away some of the positivity your efforts should have created. Whatever message you use it is important to manage expectations. While “as soon as possible” is fine, if your typical response time is 30 minutes or 3 hours, it might be better to let customers know. That will avoid creating further frustration, but be aware that depending on the type of business, longer times may have a knock-on effect in terms of more calls to your helpline. But at least it’s honest. Stringing customers along can be one of the greatest causes of poor customer experiences (71% of consumers picked waiting on hold as their number 1 customer service complaint. The offline message fires when a user sends a message outside your set opening hours, assuming you’ve set such hours. In international businesses operating across multiple time zones, this can be extremely important. In more localised businesses people may be fine that you don’t provide service after 8pm, but if your 8pm happens to be 2pm for your customer it might be a good idea to let them know. For this reason actually specifying your opening hours, with the appropriate time zone, in your offline message could be very helpful. A certain percentage of your customers are always going to want immediate service, but knowing that it is the middle of the night where you are should help manage expectations. Providing a link to your FAQ page or your knowledge base might be a win-win. Many customers bypass this step and go straight for the contact, but if they know you’re closed they may be more motivated to resolve the issue themselves. That link could also be included in one of the other auto messages, but be careful not to overdo it, as it could become annoying very quickly. Depending on the type of business, it might be a good idea to include an emergency number here. There are other potential messaging auto-responses like the close message we offer in ServiceDock (a good place to ask for feedback or Facebook likes etc. ), but these are the key messages that every business should be using. Too many auto messages are likely to cause more problems than they solve unless you’re using them for a specifically defined purpose (e.g. updating customers on a delivery status). In such situations, I would recommend always providing a human option as a backup to avoid customers getting caught in what might be termed a bot loop. If you have any better suggestions I would love to hear them in the comments.